On the 10th January 1928 our school opened. The plan was on the cross lighting system which gives good lighting and ventilation. There were five classrooms and two hundred and twenty pupils. It was built with pressed bricks and Norton stone concrete dressing and slates of the Blue Welsh variety. The Parish Priest Father Ord was the corresponding manager and the following Teaching staff: Joseph Ellis Head, Thomas Reid, Lucy Thornton, Dorothy Potts, Isabella Macintyre and Mary A. Redmond. Head Teacher Mr. Ellis had two sons Francis and Joseph, sadly Joseph was lost at sea during the “Second World War” where he served as Second Officer, on the “S.S. Bibury” of the Merchant Navy, it sank in the English Channel. Francis was ordained a Priest he devoted his life to the church and died in November 2000. Mr. Ellis retired in 1949 and died in 1975 aged 90. Margaret Coughlin 1988 -2011 (Miss Coughlin has been the longest serving teacher and head with 40 years continuous service.) and Lisa Ashton is the present Head. 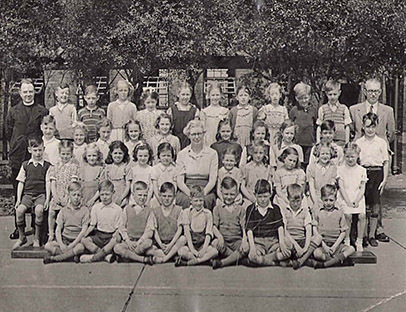 In September 1968 with the opening of the "St. Bede's "Comprehensive" in Peterlee it changed to a Junior and Infant School. On the evening of the 18th December 1979 the School suffered its worst tragedy. Two youths broke into the school and vandalised the hall and classrooms, then breaking into the Heads office, starting a fire in the stock cupboard, it destroyed the entire East Wing that later had to be demolished. Thanks to the fire service they saved the rest of the building. But for the fire we would not have our Beautiful new church on its present site. Information from School log book, Nicholas Spooner and Austin Carr. In the sporting the world the most well known ex-pupil, Maurice Cullen, was "British Lightweight Boxing Champion". He won the title on April 8th 1965, also winning a Lonsdale Belt for successfully defending the title 5 times. Sadly Maurice died on 29th November 2001. May he rest in peace. 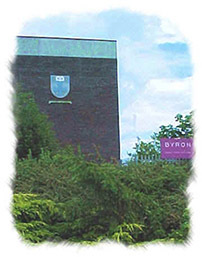 St. Bede's Catholic Comprehensive School is an 11-18 mixed comprehensive for boys and girls living in the East Durham area. Peterlee is a New Town with good amenities, well laid out housing and a large expanse of greenbelt. A Dene (river valley) managed by the National Conservancy Council bisects the town, which is an area of great natural beauty. The school was officially opened in 1970 by Bishop Hugh Lindsay. It is a well laid out purpose-built comprehensive, surrounded by very large playing fields. The school has a large Science block, Technology block, Library, Drama Studio, Sports Hall, separate pastoral areas, specialist teaching blocks and Sixth Form accommodation.